Hillary Clinton’s claim that she and Bill left the White House “dead broke” has evoked a storm of sympathy. Hillary Clinton’s claim in an interview with Diane Sawyer that she and Bill left the White House “dead broke” has evoked a storm of sympathy and support, even from beyond the grave. 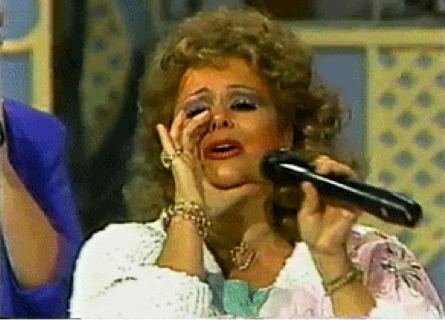 Tammy Faye Bakker gives a shout out to Hillary Clinton. According to a ghoulish Tammy Faye Bakker, interviewed via GoogleSeance TM satellite, there is widespread sympathy for Hillary throughout Dante’s Third Region, where she and history’s most egregious fakes, tricksters and con men are eternally confined. Dark lines of mascara were dripping down her cheeks. “See?” she added, dabbing. Bakker added that despite Bill’s presidential salary of $200k/year and the finest room, board and air travel for almost a decade, not to mention perks like free in-house blow jobs, Hillary genuinely felt broke because she actually had to check to see how much money was available for their new multimillion dollar home, Bill’s Harlem office, Chelsea’s private school, bribes, legal fees and so on. These little things can add up. Poor Hillary indeed, I thought.